We spent this past weekend taking in the sights and sounds of Hogwarts and Hogsmeade at the Wizarding World of Harry Potter at Universal Studios. As big Harry Potter fans, to say we were excited for our trip to Hogwarts is an incredible understatement. We've been counting down the days ever since we booked our trip, and we're happy to say that for the most part, the Wizarding World of Harry Potter met all of our expectations! From the snacks to be bought at Honeydukes, to the jokes and toys lining the shelves at Zonkos, we loved our time perusing the shops in Hogsmeade. 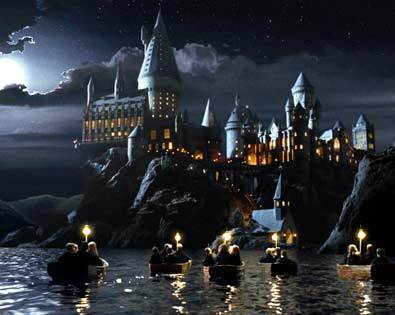 Plus, the ride inside the Hogwarts castle was incredible - it was like riding a broom! Though we should note, if that's what riding a broom is like, we're going to stick to sports where our feet are planted firmly on the ground, thank you very much. Riding a broom is quite dizzying! It was about 95 degrees outside, so unfortunately, we didn't don our Hogwarts School Robes, nor our Gryfinddor scarf and hat. A group of "students" in the park were wearing full costumes, and man, did we feel bad for them, sweating under the hot sun! Lots of tourists in the park were wearing their Harry Potter glasses, and a few were carrying around wands that they'd purchased from Ollivander's Wand Shop. Want to deck yourself out in Harry Potter gear for your own trip to Hogwarts? Check out all our Harry Potter costumes and props here.